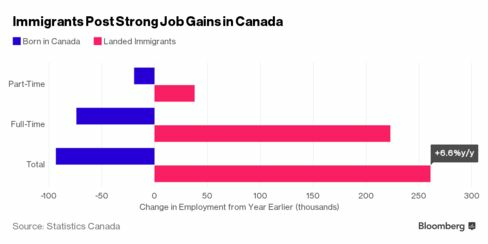 Bloomberg | While the merits of immigration are being contested by politicians in Europe and the U.S., data show Canada’s economy has already become entirely reliant on immigrants for its labor growth. The number of landed immigrants employed in Canada rose by 261,200 in the year through May, up 6.6 percent from a year ago, the latest Statistics Canada data show. Jobs held by native-born Canadians were down 93,300 over that time. While data only goes back to 2006, if the trend continues it may mark the first annual decline outside of a recession for native-born Canadians in decades. This reflects two things. Falling commodity prices are driving economic activity away from resource regions with lower immigrant populations, like Alberta, to urban centers with heavier concentrations of foreign-born workers like Toronto and Vancouver. More significantly though, the data show the extent to which Canada’s native-born baby boom population is aging and exiting the labor force, even in its booming cities. Canada’s demographic tipping point has arrived, and without immigrants — who have a much younger demographic profile — there will be no growth. In some ways, Canada is a bit of a test case for immigration given it’s aging faster than most industrialized nations, and relies more on foreign-born employment than most other rich countries, according to the Organization for Economic Cooperation and Development. In Toronto, the share of immigrants in the city’s workforce has been above 50 percent for the past 8 months.